SSRIs (selective serotonin reuptake inhibitors) are used to treat depression and other mental health disorders. 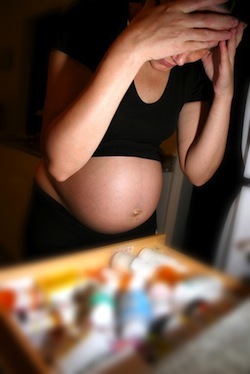 When the benefits of taking SSRIs during pregnancy outweigh the risks, it is recommended that pregnant women continue treatment throughout pregnancy and the postpartum period. A new study suggests doctors need to be prepared for possible increased bleeding if pregnant patients give birth via C-section while taking SSRIs. The study, published in JAMA Internal Medicine, reviewed patient records from 375 hospitals. The review included more than 500,000 patient records. Records of patients taking SSRIs were compared to records of patients not taking SSRIs. Researchers noted length of hospital stay, mortality (in-hospital), bleeding events, readmission within 30 days and transfusion. Of the more than 500,000 records about 14% (72,540) patients were taking SSRIs prior to surgery. Zoloft was the most commonly used drug among patients treated with SSRIs. Patients taking SSRIs prior to surgery were more like to suffer bleeding events, by readmitted to the hospital or suffer in-hospital mortality after surgery compared with control patients. There was no specific mention of C-sections in the study, but C-section delivery is considered major surgery and thus the increased risk of bleeding during surgery could be associated with C-section delivery. Source: Andrew D. Auerbach, MD, MPH; Eric Vittinghoff, PhD; Judith Maselli, MSPH; Penelope S. Pekow, PhD; John Q. Young, MD; Peter K. Lindenauer, MD, MS. Perioperative Use of Selective Serotonin Reuptake Inhibitors and Risks for Adverse Outcomes of Surgery. JAMA Internal Medicine. 2013;():1-7. doi:10.1001/jamainternmed.2013.714.